you like to receive a customized offer? at +49 (0)421 5907-07 ! Large risks require outstanding effort. Marine Underwriting is on hand with service and advice for customers by offering insurance solutions with 160 years’ experience and 90 specialists. As one of the main players for marine insurance in Germany, we support global as well as medium-size enterprises with tailor-made insurance solutions. We act based on our Hanseatic origin and classic virtues of reputable merchants. We are one of the few international, middle-market, privately managed companies in the industry — a difference that you will feel when working with us. We will never be just another faceless supplier; we perform the tasks entrusted to us with Hanseatic reliability and personal commitment. Our tradition is change: We adapt to the requirements of the industries, markets and cultures, offering you a level of know-how that is second to none in this sector. In all this, we strive for long-term and sustainable business relationships. We are cosmopolitan, service-oriented, innovative, and diligent in everything we do. In the middle of the 19th century, the Hanseatic towns were in an optimistic mood: Large shipping companies were springing up, shipping their goods to faraway countries. We have been there from the beginning —underwriting international transport insurances since 1858. Today, Lampe & Schwartze KG is one of the ten largest insurance providers in Germany. As an underwriting agency, we have many years’ experience in insurance on a global scale. Being authorized by a multitude of insurance companies we compile many advantages of an efficient outsourcing solution. This mutual trust has existed for many years. Your advantage: You get direct access to a global network, and you benefit from exceptional coverage capacities and claims management from a single source. 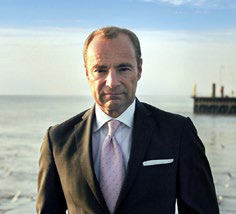 H.-Christoph Enge the managing partner responsible for Marine Underwriting is one of the leading figures of the German marine insurance market. He is active in various market committees of the insurers association and has coauthored various publications on marine insurance. How has Lampe & Schwartze Marine Underwriting (L&S Marine Underwriting) managed to offer first class service in the field of marine insurance for more than 160 years? L&S Marine Underwriting covers that division as close as possible. Marine transport insurance is still a complex and know-how intensive class. We are cosmopolitan and have an appetite for big and difficult risks - but that does not mean we only want to underwrite difficult business. As a partner-led company, we can afford to think and act long term which in consequence leads to the same in relationships and partnerships in the international insurance markets. We pay great attention to our employees and feel blessed to have a good mix of employees with many years of experience as well as younger team members with new talent and a fresh perspective. The aim is to have a highly diverse pool of expertise. In addition to insurance and shipping specialists and merchants, we employ lawyers, navigators, engineers and employees with military backgrounds. Also important to us is the continuous professional and social training. Our team reflects the diversity we value, collectively we speak 25 languages and have various nationalities under one roof. This means that not only do we speak many languages but also have a deep understanding of the respective countries and regions in which we operate. In addition, due to the very low employee turnover, the contact persons in our company are available for many years. What is special about Lampe & Schwartze Marine Underwriting and what are some of the values important to you? We are more than solely a financial service provider who administers policies, claims and funds: We also provide our partners with our full know-how not only in insurance matters, but also in terms of risk management. In other words, we need to know the market and the specifics of our customers’ risks in detail to have a very “hands on” approach. We adhere to values. That may sound a little old-fashioned but the good old hanseatic virtues are still guiding principles for us. Trust, decency, fairness, reliability and cosmopolitan attitude as well as responsibility for the common good are not empty words for us. What makes the Assekuradeur of the 21st century? The Assekuradeur still represents a valuable business model of the 21st century, which in spite of disruptive developments is not obsolete. But the future requires a healthy mix between modernity and tradition in which state of the art digital solutions fit into the special requirements of the marine and logistics world. This dynamic and flexibility gives the owner-managed Assekuradeur a decisive advantage over other providers. What challenges will the Assekuradeur and the insurance industry face in the future? A dominant topic, even after the international financial crisis, was the implementation of Solvency II. This does not only affect the insurance companies but also their partners. Only those Assekuradeurs that can professionally and permanently master the challenges of Solva II and other compliance issues will have a future. Furthermore, there are increasingly disruptive approaches that attack established insurance providers. There is no way around digitization, as evidenced by the growing number of InsurTechs. We have developed digital products which provide online marine insurance including direct receipt of the insurance certificate and full contract documentation. More and more extreme natural events with severe consequences face new challenges. In this context, resilience is becoming our focus. We no longer need to ask ourselves what can happen, but learn from the catastrophes that have occurred and develop a solution-oriented plan that makes it easier to deal with these events. This is also an important aspect in securing cyber risks, which are inevitably a growing risk with the increase in digitization. What is the position of L & S Marine Underwriting within Lampe & Schwartze KG? The business streams of the Lampe & Schwartze Group are strictly separated in terms of organization and content. Marine Underwriting currently collaborates with more than 90 brokers domestically and abroad. Every broker is treated the same way.